We’ve published something like a bazillion Tesla sales charts and stats. (See “30 Nasty Charts,” for example.) But this is actually a new one. 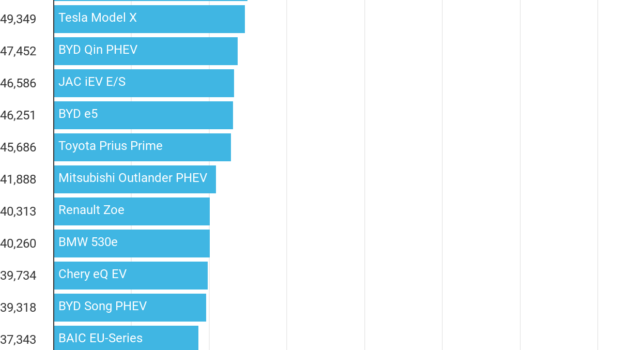 Jose Pontes of EV Volumes and CleanTechnica has his 2018 tally wrapped up and it puts the Tesla Model 3 in the #1 position globally among all plug-in vehicles. In fact, the Model 3 was approximately 55,000 sales above the #2 BAIC EC-Series, an extremely popular Chinese model. The Model 3 gobbled 7% of the plug-in vehicle market, while the #2 EC-Series and #3 Nissan LEAF each had 4%. After those top three, as the chart shows, the Tesla Model S and Model X were #4 and #5, respectively. They were followed by three Chinese models and then the Toyota Prius Prime and Mitsubishi Outlander PHEV. Side note: If you have a Tesla Model 3, Model S, or Model X on the way (and the order was in before February 3), but you didn’t use a referral code for 6 months of free Supercharging (or 9 months if you didn’t test drive the car), then you can still use my referral code — tomasz7234 — or someone else’s if some other Tesla owner referred you. Naturally, you and I know what’s so special about the car, but these benefits bear repeating. Much in the consumer market comes down to money, or value for the money. The Model 3 is the safest car at or near its price, the quickest car at or near its price, the highest tech car at or near its price, and the most autonomous car at or near its price. It’s also beautiful, and cool. Furthermore, due to its long range and superfast charging capability, it is “road trip ready” — few electric cars are. Additionally, while many consumers don’t spend a lot of time crunching “total cost of ownership” numbers, those who do so have found the Model 3 to be more competitive with mass-market cars like the Toyota Camry and Honda Accord than you might think at first glance. When you combine the performance, tech, styling, brand factor, and total cost of ownership, you get a monster of a vehicle in the Model 3, a package no other plug-in vehicle on the market can currently match. That’s not to say there aren’t reasons to buy other EVs. 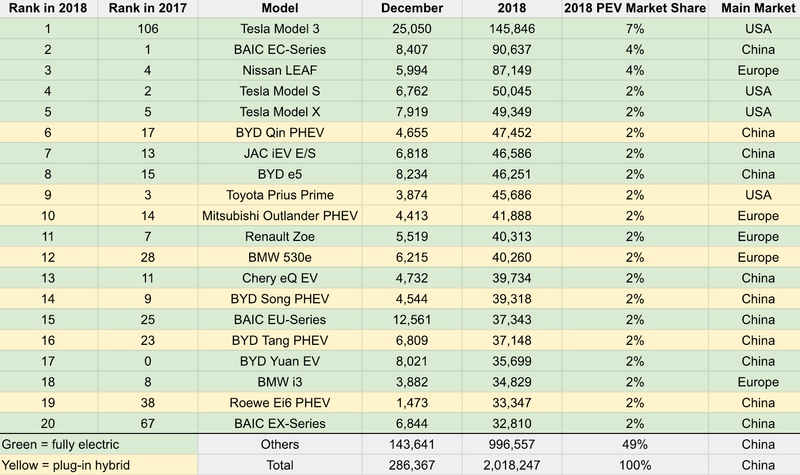 Remember, 93% of plug-in vehicle sales in 2018 were not Model 3 sales. 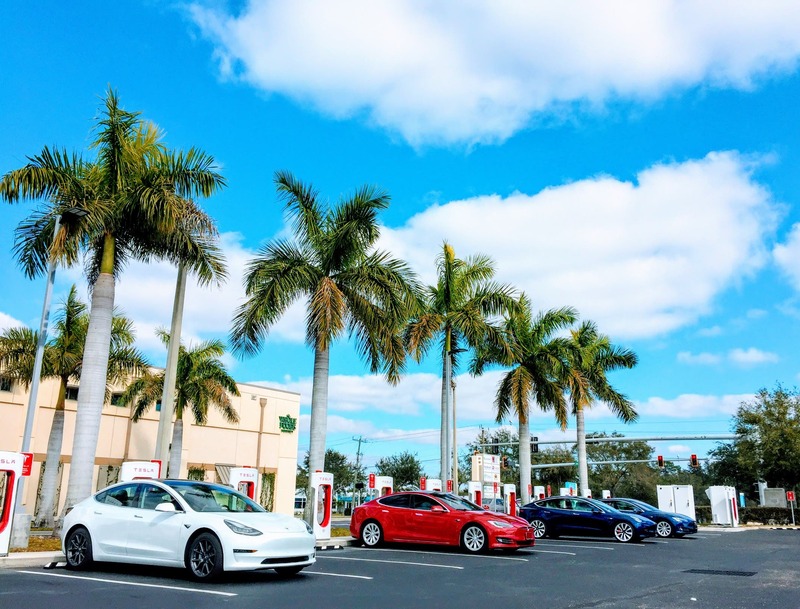 Nearly 2 million non–Model 3 electric cars, SUVs, and crossovers made it into consumers’ parking spots. Still, there’s clearly a new king of the hill, and its young Tesla’s 4th model. Aside from Tesla getting all three of its current offerings in the top 5, you also have to give props to BYD for getting 5 models in the top 20 and BAIC for getting 3 models in the top 20. Zachary Shahan Zach is tryin’ to help society help itself (and other species). He spends most of his time here on CleanTechnica as its director and chief editor. He’s also the president of Important Media and the director/founder of EV Obsession and Solar Love. Zach is recognized globally as an electric vehicle, solar energy, and energy storage expert. He has presented about cleantech at conferences in India, the UAE, Ukraine, Poland, Germany, the Netherlands, the USA, and Canada. Zach has long-term investments in TSLA, FSLR, SPWR, SEDG, & ABB — after years of covering solar and EVs, he simply has a lot of faith in these particular companies and feels like they are good cleantech companies to invest in. But he offers no professional investment advice and would rather not be responsible for you losing money, so don’t jump to conclusions.